Aon’s services help employers overcome issues like this by developing means to control their healthcare costs. Now, MPIRICA’s insight into actual outcomes in the surgical space will augment their work. Here’s are three arenas where MPIRICA’s unique capabilities bring new value to the process. The best illustration of MPIRICA’s proposition starts with examining a dominant trend in benefits design today: ‘Centers of Excellence.’ In this model, self-insured employers partner with certain hospitals to supply high-volume surgeries for their employees. But in selecting these provider-partners, employers have no objective, data-driven means to evaluate performance. 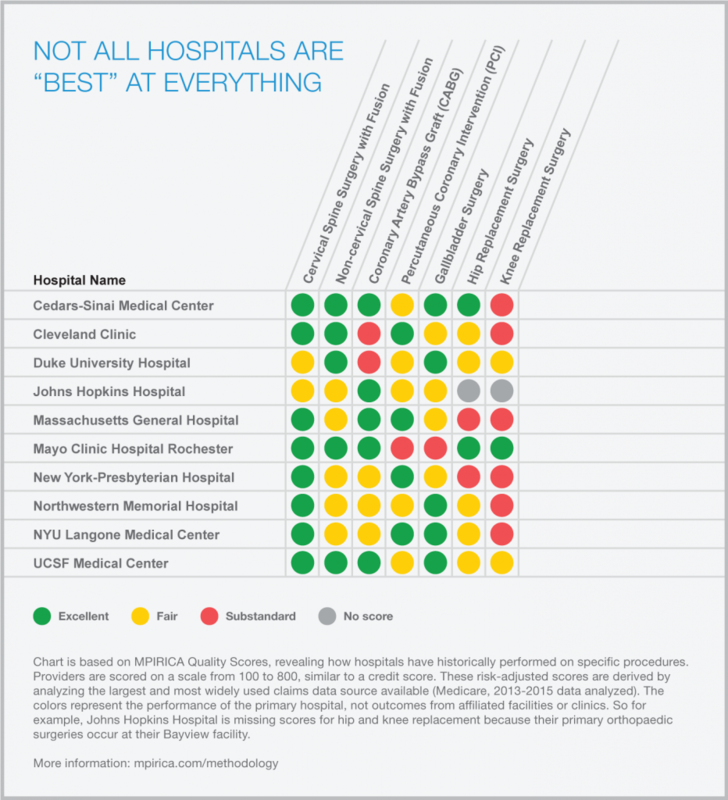 Instead, they lean on a proxy — the hospital’s reputation. The problem is that reputation doesn’t always coincide with reality. Prestigious institutions don’t always produce the best outcomes. Steered toward eminence instead of performance, well-meaning employers can end up in partnerships with sub-par providers. And these less capable surgeons can have a dramatic impact on employees’ health. Compared with their high-performing peers, sub-par surgeons triple the risk of adverse outcomes like longer hospital stays, readmissions, or death. 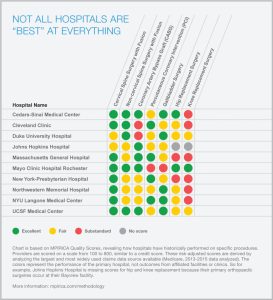 The MPIRICA Quality Score prevents that from happening, by giving employers the data they need to see beyond prestige, and account for the real outcomes that providers produce. The Quality Score is an independent, risk-adjusted measure of each surgeon’s track record of success. Employers can use it to ensure that their partners are real Centers of Excellence. Reliable quality data opens a range of options for employers. Once they can definitively identify high-value providers, they can structure design, network, and contracting strategies to effectively control their surgical spending. This could mean curating high-performance networks to cover employees’ needs; offering navigation support to guide employees to the best providers in their area; using deductible waivers as an incentive to consult with high-quality surgeons; deploying referenced-based pricing models to protect against out-of-network procedures — or any combination of the above. No single strategy will suit every employer’s situation. But all of them will only function if the underlying data is sound. That’s what makes objective measures of surgical quality so valuable. In a healthcare marketplace that many patients struggle to navigate, employees place a lot of stock in their employers’ guidance; they trust that their companies will point them to providers who can keep them safe. That’s the promise implied in a benefits package. The MPIRICA Quality Score gives employers the means to make good on this promise. With objective outcomes data, employers can extend the same scrutiny and diligence that they’d offer to their loved ones. They can protect employees from excessive surgical risk — as if they were part of the family. Many of us on the MPIRICA staff have personal experience with this. Family members with surgical needs have come to us for recommendations. When this comes up, it gives us tremendous peace of mind to know, with objective certainty, that our recommended surgeons have strong historical outcomes. There’s no reason HR departments can’t enjoy the feeling, too. Of course, sincerity and rigor can prevent harm and safeguard productivity. But the benefits extend beyond performance metrics. Caring for employees also inspires widespread trust across an organization. That’s an enduring and invaluable asset for any company. Meaningfully protecting employees starts with a clear conception of quality. Ultimately, that’s what Aon, MPIRICA and Amino offer to employers — a means to resolve the information asymmetry endemic in healthcare. When firms and providers can negotiate in good faith, knowing they have all the relevant data on hand, the benefits can be dramatic. Transparency in quality data will yield fairer negotiations, cost-efficient care, and, ultimately, healthier employees. This partnership is dedicated to bringing that transparency about. The whole team at MPIRICA is excited about the possibilities for this new relationship. It makes us even more optimistic that a scientific approach to surgical quality data will change the whole industry for the better. Questions about MPIRICA? Contact us to find out more.